The type of restitution you will carry out will depend on the type of sin committed. (For a more thorough treatment of the topic, see our book in this series entitled Restitution: An Important Message For the Overcomers. If a man steals an ox or a sheep and slaughters it or sells it, he must pay back five head of cattle for the ox and four sheep for the sheep. If a thief is caught breaking in and is struck so that he dies, the defender is not guilty of bloodshed; but if it happens after sunset, he is guilty of bloodshed. AA thief must certainly make restitution, but if he has nothing, he must be sold to pay for his theft. If the stolen animal is found alive in his possession - whether ox or donkey or sheep - he must pay back double. If a man grazes his livestock in a field or vineyard and lets them stray and they graze in another man’s field, he must make restitution from the best of his own field or vineyard. If fire breaks out and spreads into thorn bushes so that it burns stocks of grain and standing corn or the whole field, the one who started the fire must make restitution. If a man gives his neighbour silver or goods for safekeeping and they are stolen from the neighbour’s house, the thief, if he is caught, must pay back double. But if the thief is not found, the owner of the house must appear before the judges to determine whether he has laid his hands on the other man’s property. In all cases of illegal possession of an ox, a donkey, a sheep, a garment, or any other lost property about which somebody says, ‘This is mine,’ both parties are to bring their cases before the judges. The one whom the judges declare guilty must pay back double to his neighbour. If a man gives a donkey, an ox, a sheep or any other animal to his neighbour for safekeeping and it dies or is injured or is taken away while no-one is looking, the issue between them will be settled by the taking of an oath before the Lord that the neighbour did not lay hands on the other person’s property. The owner is to accept this, and no restitution is required. But if the animal was stolen from the neighbour, he must make restitution to the owner. If it was torn to pieces by a wild animal, he shall bring the remains as evidence and he will not be required to pay for the torn animal. If a man borrows an animal from his neighbour and it is injured or dies while the owner is not present, he must make restitution. But if the owner is with the animal, the borrower will not have to pay. If the animal was hired, the money paid for the hire covers the loss. (Exodus 22:1-15). 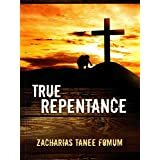 Say to the Israelites: ‘When a man or woman wrongs another in any way and so is unfaithful to the Lord, that person is guilty and must confess the sin he has committed. He must make full restitution for his wrong, add one fifth to it and give it all to the person he has wronged. But if that person has no close relative to whom restitution can be made for the wrong, the restitution belongs to the Lord and must be given to the priest, along with the ram with which atonement is made for him.’ (Numbers 5:5-8). When Jesus reached the spot, he looked up and said to him, ‘Zacchaeus come down immediately. I must stay at your house today.’ So he came down at once and welcomed Him gladly. Was I paid more money than I ought to have received from any government treasury or any similar paying agency? Have I ever cheated my bankers in any way? Have I ever cheated my employer in any way? Did I steal money, equipment, various utilities from my employer? Did I make false claims or did I exaggerate and inflate claims? Did I claim money for work I did not do? Did I close my eyes while someone else stole from my employer? Did I appear loyal before him while working against him behind the scene? Did I team up with those who were against him? Did I exaggerate his weaknesses and thus belittle him? Did I knowingly accuse him before others for things I knew he had not done? Did I accept the false accusations of him by others for things I know he was not guilty of? Did I ever cheat my employee? Did I withhold his promotion unduly for my own gain? Did I withhold his advantages when they were due? Did I exploit him in any other way? Did I steal from any shop? Have I ever been given more change than I deserved and I knowingly kept it? and then willfully decided not to let him have it, pretending to have forgotten? Did someone give me something to keep for him and because he forgot I kept it for myself? Did I mix good and bad articles in a sale placed the bad ones underneath and the good ones on top and thus cheated someone in a sale? Did I alter landmarks to my advantage? Did I live in a rented apartment and through guile went away without paying the rents? Did someone send me to buy some things and I decided to keep the change? Did I abusively use electricity, water, the telephone, and so on because someone else was paying the bills? Did I maltreat someone because he comes from a tribe or nation I do not like? Did I give someone more marks than he deserved because I wanted to use him? Did I give someone less marks than he deserved because I hated him for some reason? Did I give marks arbitrarily for papers I had not properly read and assessed? Did I falsify my age in order to gain an admission or obtain a job? Did I promise marriage to someone then used the person and then looked for some false reason to break up the relationship? Did I make a girl pregnant and then refused to face up to my responsibilities under the pretext that I was not sure I was the one who made her pregnant? Did I run away from my partner and I am living maritally with another person, giving the impression that I have never married? Am I hiding the reason why we cannot have children from my mate, a reason that is owing to my promiscuous past? Have I refused to face up to my responsibilities to an illegitimate child that I had before I believed? Am I standing in the way of my mate taking responsibility for an illegitimate child that he had before we married? Am I using my body as an instrument of prostitution with my marriage partner? Am I unfair in the treatment of the relatives of my spouse, giving most of the money and attention to my own family members? As you answer these questions, you will confront financial and moral issues about which you should carry out restitution. Do. You too should go and do likewise.